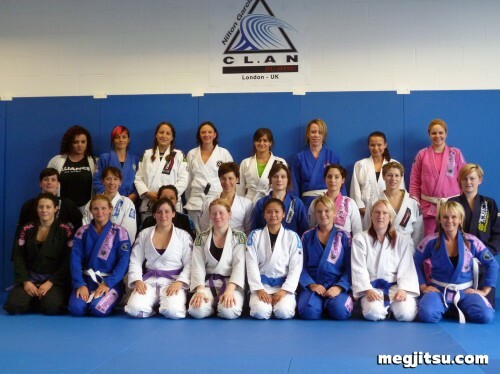 The London BJJ Women’s Open Mat held its 8th event on Sunday 7 August at the Gracie Garcia gym in Camden, North London. Susan Mansfield, our hostess for the day, did a wonderful job welcoming the girls, ensuring that the event went smoothly and getting us ready to rock with an athletic warm-up. Indeed, a visit to the Gracie Garcia academy is well worth the trip through the streaming hoards of whipper-snappers, drop outs and tourists. The club is housed in a lovely, open space with plenty of natural light and these awesome cubbies for kit. The place was immaculately clean. Indeed, Susan reported to me that while she’d arrived early to ensure the place was looking good, the Gracie Garcia boys had scrubbed and tidied for our arrival. Nilton Garcia, head of the club, also left us a huge bowl of sweets! It was really kind of the Gracie Garcia club to welcome us with such enthusiasm and we certainly made the most of a very rainy afternoon on their mats. As usual the Open Mat attracted women from a wide range of experience levels, from BJJ-first-timers to purple belts, including two of Britain’s most recent female purple belts, Lisa James (Urban Kings) and Sarah ‘The Mauler’ Merriner (Carlson Gracie); big congrats, ladies! 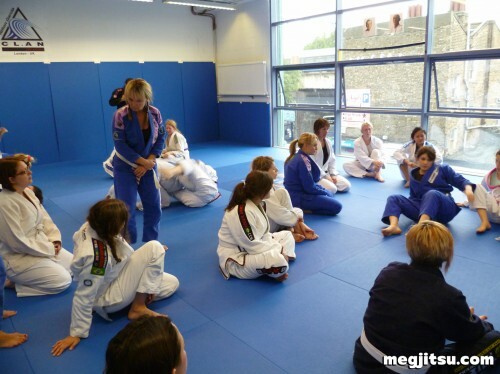 Our events continue to grow and we had just under 30 women on the mats on Sunday, coming from London, Leeds, Manchester and one visitor from Atlanta, GA. In order to accommodate the range of experience levels we split the room to operate a sparring area and a drilling area, which ran in parallel. I thought this was a great way to run the event as it allowed those women who wished to drill specific problem areas the opportunity to do so, while freeing others to just spar, if that was their cup of tea. Leoni Munslow (BJJ School), Kat Gibson (RGA) and myself rotated the role of ‘drill mistress’ over the course of the Open Mat. I had the pleasure of working some mount retention and mount escape basics with the grrls as well as, what I know as, the ‘scissor sweep’ from guard; the ladies were interested in looking at these areas. For my part, I always seek to use the Open Mat as an opportunity to roll with women I’ve not trained with before. I had a wonderful roll with Dio Atienza (BJJ School) who is a recent blue belt; her base is fantastic as well as her guard pass defence. As a lighter player (mid 50kgs), Dio is also very nimble, quick, and has little hands that can creep into the tightest space! I also enjoyed a roll with Shereen Fons (Alliance, Atlanta) who is, in addition to a BJJ blue belt, an Olympic lifter of 220lbs of pure beef. I’ve never encountered such a female body and it was a really interesting opportunity to roll with someone so strong and bulktastic, but surprisingly nimble in bursts. Our Q4 event will be hosted by Beth Tejada at the Roger Gracie Academy on Sunday, 4 December 2011 (the weekend after the English Open). Full event details to be confirmed. Big, big thanks to Susan Mansfield and Gracie Garcia for accommodating us and to all the women who participated to make the event a great success. Thanks for all the help ‘Drill Mistresses’. It was a great day and really got to the bottom of those problem areas. Will look forward to seeing the ladies in December. Thanks for coming along and getting stuck in, Jolie!